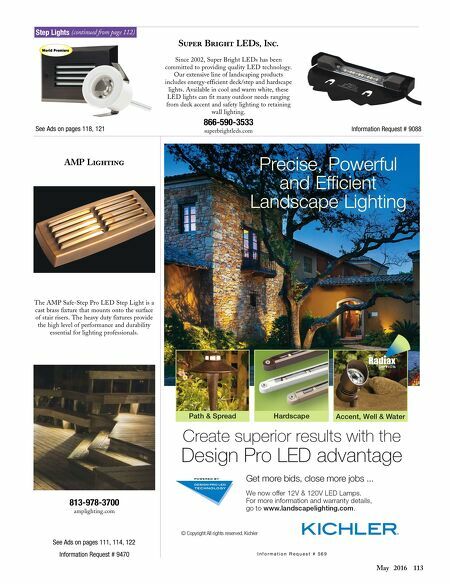 112 Landscape Architect and Specifier News 2016 Specifier's Guide lighting Step Lights (Continued on page 113) TJB-Inc. See Ad on page 15 Information Request # 9297 Wall Eye ll is a 12 V, AC/DC, 2 W, LED, Stainless Steel fixture that is only 1/32-inch thick and mounts under any retaining wall, coping stone or step tread. 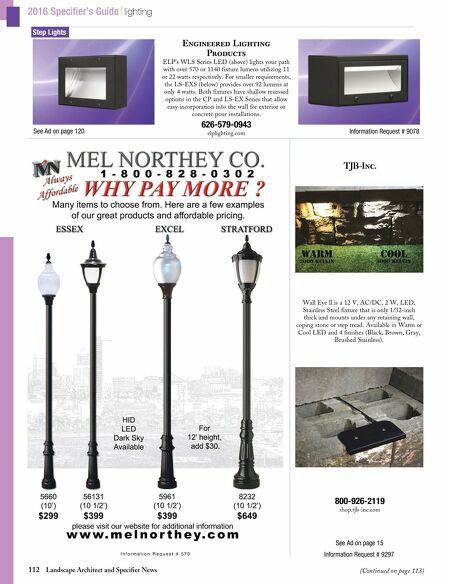 Available in Warm or Cool LED and 4 finishes (Black, Brown, Gray, Brushed Stainless). 800-926-2119 shop.tjb-inc.com I n f o r m a t i o n R e q u e s t # 5 7 0 See Ad on page 120 Information Request # 9078 Engineered Lighting Products 626-579-0943 elplighting.com ELP's WLS Series LED (above) lights your path with over 570 or 1140 fixture lumens utilizing 11 or 22 watts respectively. For smaller requirements, the LS-EXS (below) provides over 92 lumens at only 4 watts. Both fixtures have shallow recessed options in the CP and LS-EX Series that allow easy incorporation into the wall for exterior or concrete pour installations.